Buff-tailed bumblebee worker (Bombus terrestris). Photo credit: Bill Temples. One of the ‘Big 7’ widespread and abundant species, found in a wide range of habitats across the UK. Less abundant in Scotland than it is in England, but has been increasing in recent years. At least in cities in the southern UK the species is becoming winter-active, with nest establishment in October-November and workers flying all winter, feeding particularly on Mahonia bushes. A large species with dark yellow bands at the front of the thorax and middle of the abdomen, queens are the only caste which actually have buff-coloured tails: in workers and males the tails are white, although males in particular often have a narrow but distinct yellow-buff band at the front of the tail. Queen Buff-tailed bumblebees. Photo credits: Les Moore (left), Paula Lightfoot (right). While the huge Buff-tailed queens are distinctive, workers are practically indistinguishable in the field from the White-tailed bumblebee complex (White-tailed bumblebee, Bombus lucorum; Northern white-tailed bumblebee, Bombus magnus; Cryptic bumblebee, Bombus cryptarum), and DNA testing is the only reliable way to accurately identify many specimens. Males are large, and the yellow in the tail distinguishes them from the White-tailed complex, but the situation changes as our understanding of the Cryptic and Northern white-tailed bumblebees increases. The scarce Broken-belted bumblebee (Bombus soroeensis) can be very similar but the yellow abdominal band extends forwards onto the first abdominal segment (always only on the second segment in Buff-tailed bumblebees), and the front of the white tail often contains a thick orange suffusion, rather than yellow. 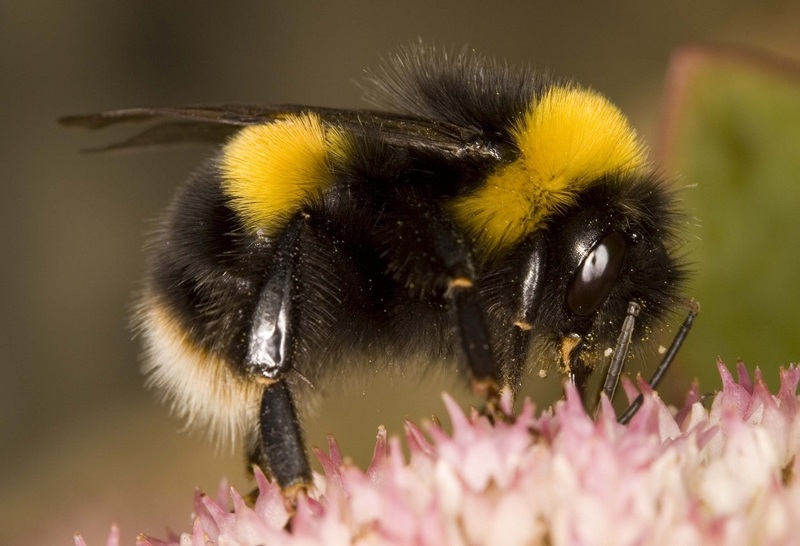 The Southern cuckoo, Gypsy cuckoo and Forest cuckoo bumblebees (Bombus vestalis, Bombus bohemicus, and Bombus sylvestris) can look similar to worker or male Buff-tailed bumblebees, but the first two usually have yellow patches on either side of the abdomen, at the front of the tail, and males of the Forest cuckoo have a red or orange tip to the tail. All also have the hairy hind tibia characteristic of cuckoo bumblebees.